There are multiple senses in which dinosaurs are “living evidence of a powerful Creator.” Like all of the biological organisms inhabiting the planet earth, dinosaurs resist a naturalistic explanations of origins. That is, the missing transitional forms and shortcomings of naturalistic mechanisms (random genetic changes accumulating complex information systems) and inadequacies of natural selection apply well to the dinosaurs. The lack of clear phylogeny (evolutionary lineage) is a mystery that confounds the common ancestor theory of origins. In another sense, the dinosaurs demonstrate that some of the biggest, most impressive creatures lived long eons ago on the primeval earth. The book of Job clearly communicates that God created these creatures so that men throughout history might be awed with His power (Job 41:10). Lastly, there is evidence that some dinosaurs (and similar great swimming and flying reptiles) still survive. If these creatures are found morphologically unchanged (except smaller and arguably less fit), then this scenario would fit best within the creation model. Like the Psalmist, we would say, “Praise the LORD from the earth, you dragons, and all deeps:” (Psalm 148:7). Richard Dobbs contributed a great deal of original artwork (including the sketch on the home page). Creation Evidences Museum gave permission to use several of their exhibits. Some of the exhibit graphics are from Dr. Duane Gish’s delightful book Dinosaurs by Design. Special thanks to the Institute for Creation Research for making them available, especially the drawings by Earl & Bonnie Snellenberger. Rob Hefner supplied the photo of the Prayer Stick at the Manitou Cliff Dwellings Museum. Answers in Genesis permitted us to utilize original art by Dan Lietha. The Hovinds of Creation Today granted the unlimited use of their material, including multiple drawings by Bill Rebsamen. Rick Lalonde provided the pictures of his beautiful iguana Kyle. The fishing Tanystropheus picture on the Ancient Plesiosaurs page was created by Ciavatti Gerard. Joe Tucciarone permitted the use of his exceptional Quetzalcoatlus drawing. Credit for the Tuatara picture goes to Michael Schneider. Credit for the draco picture goes to NASA and Cislunar Aerospace, Inc. The frilled lizard pictures come courtesy of Andy, Lee, & Celly’s Lizard Web Page. Michael Cremo consented to the use of pictures and material from his book Forbidden Archaeology. 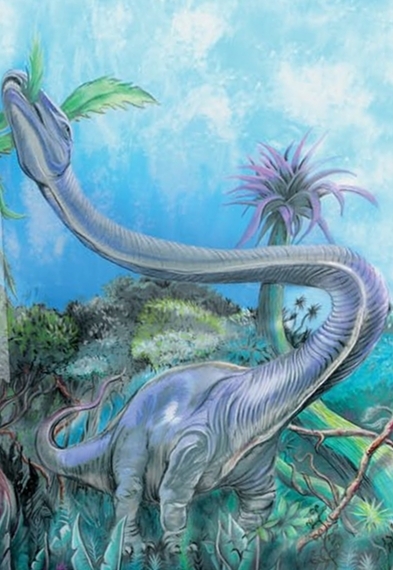 The picture on the Plesiosaur Tank page is by Julius Csotonyi. The Horned Chameleon photo is by Gail Fletcher. The Sailfin Dragon photo is by Scott Corning. Zach C. Coker drew the wonderful reconstruction of a Clevosaurus specimen. Dr. Jack Cuozzo, author of Buried Alive, generously assisted by providing multiple photos. The picture of the Apatosaurus and tribesman on the “Monster of Cameroon” page is from Roy Mackal’s 1987 book A Living Dinosaur: In Search of Mokele-mbembe. The Dimorphodon picture on the PNG Expedition page is modified from DK Images of London. Rights to modify and display it were purchased from them. The pics of the saltwater crocs came from the Garden of Eaden website. Some of the Inca Ceremonial Stone Pictures are the property of Dr. Don R. Patton’s, displayed with his permission (along with pictures of the French Chateaux dragons and the Malachite Man). Patrick Ryan took the picture of the delightful thorny devil in Australia with Ayers Rock in the back. Credit for the Regal Horned Lizard goes to Robert Parmenter at UNM. The Water Dragon picture is featured courtesy of Scott Corning. John Kirk, President of the British Columbia Scientific Cryptozoology Club which heads up the CaddyScan project permitted the use of his copyrighted Cadborosaurus photograph. The pictures of the big alligators were taken by Genesis Park staff at Florida’s Gatorland. The Triceratops family pictured on the Ceratopsian Cage page was taken at JuraPark in Bałtów, Poland. The Apatosaur Paddock picture is by Lee Krystek. Chris St. James of s8int.com provided valuable insight into the Palestrina Mosaic on the Ancient Depictions page and has brought other dinosaurian iconography to our attention. Thanks to Leo (Jake) Hebert for his artifact picture contribution on the Ancient Depictions page. Special thanks to Elma for bringing the Bushmanland engravings to our attention. Tom and Donna Eckman, missionaries to Argentina, brought the elusive sea monster of Lake Nahuel Huapi to our attention. We appreciate the British Museum giving permission to employ the picture of the Sennacherib Plate with depictions that appear to be pterosaurs on a pole from Barnett’s 1967 work. Vance Nelson supplied the photo of the Ishtar Gate of ancient Babylon and other dinosaurian depictions. Dennis Swift deserves credit for a large number of the photos on the Ancient Depictions page. We appreciate his generous help. Ian Juby gave valuable insights into the Dinosaur Deathpose and the Berean Tracks. Missionary John Pendleton assisted with the research at Acambaro featured on the Ancient Depictions page. The delightful animated dinosaur GIFs that we utilize are the work of Mary Potocska-Krizmanic of YRAM Enterprises. Genesis Park purchased rights to display them. Chris Ballard provided helpful analysis on created “kinds” as we attempted to analyze larger organisms in the past. The background picture (and much of the custom artwork) was drawn by Richard Dobbs. For more of his work, check out his website at www.dobbsart.com. Genesis Park was produced by Dave Woetzel. The webmaster is Peter Anglea. It undergoes constant changes as we seek to make improvements and vary the displays. Please take a minute to give us your suggestions before you leave. Also, we would invite you to sign up for the Genesis Park Monthly Newsletter!